It was quite a coincidence then that I was asked to review Jill Murphy’s classic, Five Minutes’ Peace. I can assure you that the research behind this review is thorough, authentic to the last soap bubble and 100 per cent accurate. Let’s just say Five Minutes’ Peace probably should not be filed under ‘fiction’. 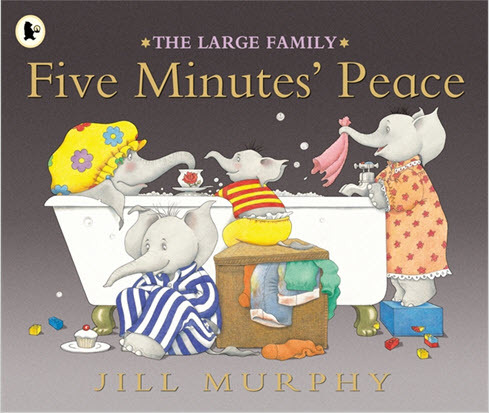 First published in 1986, Five Minutes Peace tells the story of Mrs Large, who just wants to escape her children for five minutes of quiet time on her own. Five minutes may not seem a big request but when you have three little elephants vying for your attention, it is almost impossible. Parents will appreciate the small details – one ‘child’ sitting with a cereal bowl on their head, the clearly well-practised emotional blackmail the kids trot out and the loving addition of some toys to her bath. Children may fail to see just how true and funny this book is, however it is perfect for those two years and over who like to read stories about things they can relate to! Mrs Large does not get her five minutes’ peace but she does manage three minutes and forty-five seconds – hey, who’s counting? Five Minutes Peace is available online at Fishpond for $13.97.